My good friends at Edison Research handled the data gathering for my new book, Hug Your Haters, and we discovered that customer service is being massively disrupted. Now the Edison team is back with a new edition of their annual Infinite Dial research (they partner with Triton on it) and they’ve found another disruptive force: podcasting. 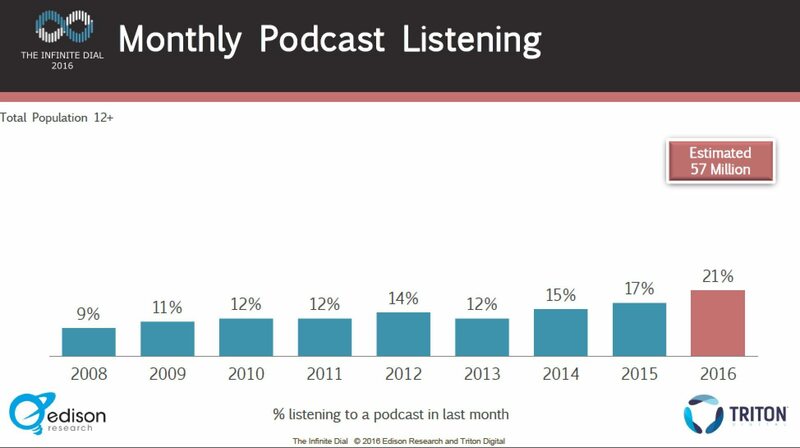 Edison first waived the flag on the explosive growth of podcasts in last year’s Infinite Dial study, but their new, 2016 podcast statistics show that momentum is building for the medium. To read all of the Infinite Dial findings (I very much recommend you do so) go here. The report is bursting with fascinating statistics, and not just about podcasts but also about online radio, streaming, social media, and beyond. But considering we produce six podcasts for marketers and businesspeople here at Convince & Convert Media (and we’re starting to produce more and more shows for corporate clients, too) the podcast statistics nestled in The Infinite Dial are of particular interest. Here are the five most important data points to understand. 21 percent of Americans ages 12 and up have listened to a podcast in the past month. That is up from 17 percent in 2015. Monthly podcast listenership has increased 75 percent since 2013. To provide some context for what 21 percent of the entire country represents, 13 percent of the USA listens to Spotify monthly, and 21 percent of the country uses Twitter. The same number of Americans listen to podcasts and use Twitter. The podcast audience is 57 million Americans in total. And while Twitter has more members than that (many more, actually) the research shows their active user base is on-par with the overall podcast audience. The rise in podcast consumption over the past two years correlates with an even larger shift in HOW podcasts are consumed. Circa 2014, most podcasts were being listened to on a computer, which restricts consumption windows. 64 percent of podcasts are being listened to on a smartphone or tablet. Listeners gravitating toward podcasts on the go opens up many more opportunities for consumption, including in the car, at the gym, and other computer-free environments. Even among regular listeners, the appetite for podcast consumption has some practical limits. Only my observation, not in the Infinite Dial research, but I find it interesting that five shows is the average given that most people have five days worth of in-car commutes, and many gym members work out five times per week. 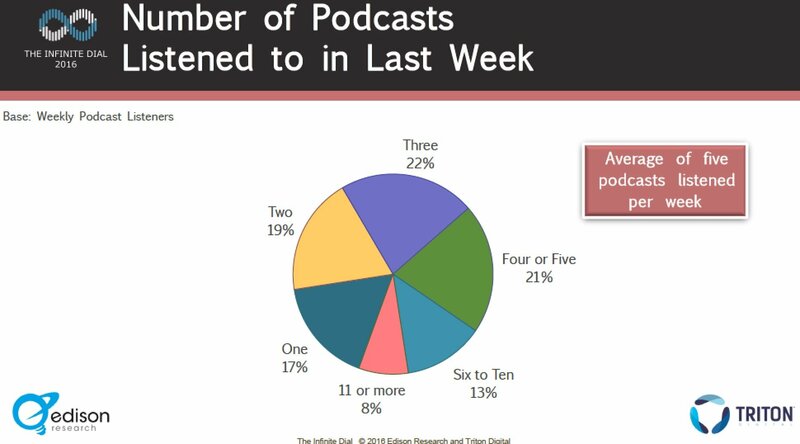 To illuminate this podcast statistic slightly more, 69 percent of weekly podcast listeners consume five shows or fewer. This has important consequences for podcast producers, as new podcasts being launched today may need to steal listeners from older shows, the same way that new blogs poach readers from blogs that have been around longer. Yes, the continued growth in consumption overall provides opportunities, but from my perspective the growth in new podcast launches is outpacing adoption by new listeners. Certainly, there is continued room for growth in podcast consumption among younger Americans. One in four Americans ages 12 to 54 listened to a podcast last month. But to really break through and become a major part of the media landscape, podcasts must become a habit for older Americans. Just 11 percent of Americans over 55 listen to podcasts monthly. And it’s not really a surprise, as finding, downloading and subscribing to podcasts requires a fair amount of technology sophistication. There are no default podcast listening devices or software, nor is there an approachable podcast directory (iTunes is a hot mess at podcast discovery, which is why I launched MarketingPodcasts.com last year). I am hopeful that new home-automation technology like Amazon Echo will become widely adopted (I love mine) and open up podcasts to a whole new audience, since you can easily listen to podcasts on that device. And even the name, “podcasts,” is something less than approachable. It’s a takeoff on broadcast that uses “pod” because the iPod was all the rage back in the day. I’m not sure I’m ready to go there for our own shows just yet, but I believe the industry (such as it is) needs to rebrand around “on-demand radio” or somesuch to make it both more clear what podcasting IS, and less nerdy for the next group of potential listeners. Please do grab the entire Infinite Dial study. 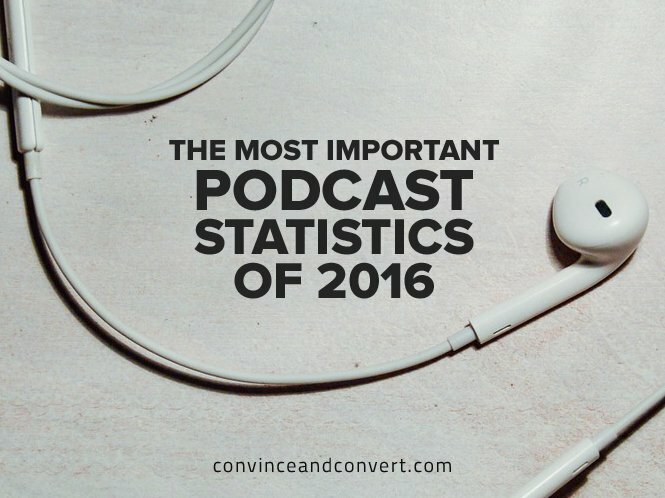 I’ve just given you a tiny taste with these 2016 podcast statistics. There’s a lot more you’ll enjoy.